Why does everyone expect you to know the details of sewing when you have admitted that you are not an expert in the trade? You know that a needle and thread are essential but other necessary supplies are not clear. You are certainly not alone in your distress. 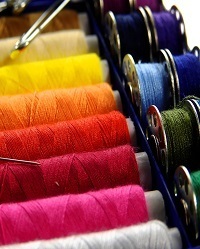 Many beginners are unaware that scissors created for fabric are necessary for sewing. You want precision when cutting so as to avoid snags that lead to rips in the material’s fiber. It is also vital to have a soft tape measure or ruler on hand to make sure that your cuts are even and outfits are tailor-made to your desires. Every sewing expert knows that universal needles are their best friends as these tools can be used for the most detailed projects. There’s much more to learn about the art of sewing. Did you know that crafting is beneficial to health? Many adults think that they have outgrown creative thinking and activities because of work and other life responsibilities. Arts and crafts, however, is not just for children! Creative projects lead to better hand-eye coordination and attention to detail. Hands-on activities also provide an escape from the daily pressures of life that sometimes involve confrontation and disappointment. Imagine a way to deal with challenges at work that did not include Happy Hour at the local bar. Crafting is the sober remedy that you need to stay sane! Get in touch with your creative side, and find another way to be productive, by using the various tips on this page! All posts in "Sewing & Crafting"